Can Network Configuration Manager manage Cisco device configurations? Yes, Network Configuration Manager can manage Cisco device configurations. Cisco router configuration, Cisco switch configuration and Cisco firewall configuration can be done using Network Configuration Manager. Apart from Cisco devices, Network Configuration Manager can be used to manage the configurations of switches, routers, firewalls, wireless access points and integrated access devices from other vendors such as HP, 3com, Foundry, FortiGate and NetScreen. What is Config Conflict and how to resolve it? Please select one or more devices from the list in Inventory. Click on the 3 horizontal dots on the top right corner of the page to get more options. A set of rules can be defined for the configuration of any device. These rules can be anything like, a particular keyword or line(s), must or must not be present in a particular configuration. One or more of these rules can be combined into a Compliance policy and then these policies can be associated with a particular device or a group of devices. If any particular device configuration is violating the associated rules, Network Configuration Manager will show a compliance violation for that particular device. To resolve the compliance status, please change the device configuration accordingly. Alternatively, if any remediation configlet is associated with the said rule, you can choose to execute that to make the required changes to the configuration automatically. What is Baseline Conflict and How to resolve it? Click on the device that has the baseline-running conflict.This will open the device details page. Check the Current Version and the Baseline version in front of Running Config header. Click on the "Current Version" to see the configuration details. Click on "Set as Baseline". This will change the status back to "In Sync". What is the impact of Baseline Conflict? Unlike Startup Running conflict, there won't be any major impact if the Baseline Running conflict is ignored. Baseline configurations are just the well-known labelled configuration. The conflict status shows you the changes made from that well-known configuration till date. If you consider your current running configuration as well set and want to save it as baseline you can choose to do that. Please click here to see how to do that. Why the credential icon is grayed in the device list? Can I apply the same credentials to multiple devices? Yes, the same set of credentials can be provided to any number of devices. Please click here to see how to provide credentials to a set of devices at a time. You can also choose to create a device group with a set of devices and then apply the credential to that group from Device Group page in inventory. Also if you find yourself using the same credentials multiple times, please save those credentials as a credential profile, and next time while applying the credential just select the profile and Network Configuration Manager will fill all the necessary details. What happens if I unmanage a device? If a device is in the unmanaged state, you won't be able to perform any important operations like Configuration Backup, Upload Config, Automatic Change Detection, Sync Configuration, Compliance Management or Change Management etc. Any schedule that contains the unmanaged device won't perform the scheduled task for the said device, even if the schedule was created when the device was in the managed state. Can I connect to a device to run CLI commands? Click on either the SSH icon to open SSH session with the device, or the Telnet icon to open telnet session. These icons can be found in the action menu provided at the top of snapshot page. Using either of the icons will open a terminal session in a slide where you can login to the device by providing appropriate credentials. Can I check the complete route via which Network Configuration Manager is connecting to the device? Yes, a network route can be traced using Network Configuration Manager for any device. Click on the device in the Inventory page for which you want to check the route. This will open up the device snapshot, you can click on the "Trace Route" icon to check the route and gateways through which Network Configuration Manager is communicating with the device. What is the use of "Browse To" icon ? By clicking "Browse To" icon you can connect to the device using a web UI, inside a browser window. Once you click the icon, Network Configuration Manager will open a session with the device in a new browser window, where you can log into the device and check all the details about the device. These details and the page where they are displayed are provided by the vendor and are not designed or controlled by Network Configuration Manager. Hence, these details, pages and options may differ for each device. How to check notification for a device? Click on the device from Inventory to open device snapshot. Then click on the "Notification" icon to open a slide with all the associated change notifications. You can also add a new notification from the same slide. How to check alarms for a device? Click on the device from Inventory to open device snapshot. Then click on the "Alarm" icon to open a slide with all the alarms ever triggered by the said device. How to check workflow associated with a particular device? Click on the device from Inventory to open device snapshot. Then click on the "Workfflow" icon to open a slide which contains all the associated workflows. How to check if a device is reachable or not? Click on the device from Inventory to open device snapshot. Then click on the "Ping" icon to ping the device and see the response. If you get a "Timed Out" error, it means the device is not reachable. What is the "Show Commands" option for a device? Show Commands give you the ability to run a few pre-defined commands on a particular device. You can select and execute any command from a given list and check the device's response in a console window. This response can also be exported to a file using the "Export" option provided in the show command slide. Where can I check all the audits for a particular device? This will open up a slide with all the device history in a timeline format. What happens when existing devices are rediscovered? If a device is already discovered and added to Network Configuration Manager successfully, there won't be any effect if you run the discovery process again and try to discover the same device. Network Configuration Manager will show the device as 'Already Exist in Inventory' in the discovery report. Why are the reachable devices not added to Network Configuration Manager? Device is not reachable: Make sure the device is up and running and is reachable via ping. SNMP is not enabled: Network Configuration Manager can discover only SNMP enabled devices, so make sure that SNMP is enabled for the device. Wrong credentials: Make sure the selected credential profile applies to the device you are trying to discover. SysObjectID is not present in Network Configuration Manager: If all the above mentioned criteria's doesn't apply to the device you are trying to discover, then check the list of SysObectID's supported by Network Configuration Manager under Settings > Network Configuration Manager > SysObjectID Finder. Click on Add and provide the device ip address and other required information and click next. Network Configuration Manager will find the SysObjectID for the device and you can assign it to appropriate device template. You can get more information about adding SysObjectID and their usage here. If you are still having trouble discovering your device(s), please contact Network Configuration Manager support team. Alternatively, you can add the device(s) manually. To do so, go to Discovery Reports under Settings > Discovery > Discovery Reports and select the failed devices from the respective discovery report and click 'Add to Inventory button'. This will give you the option to select the Device Template and Vendor to add the device. Select the appropriate Vendor and Device Template and add the device(s). Where can I see the discovery reports or history of all the discoveries done till date? In the Discovery Report tab, you will be able to see the list of all the discoveries done till now sorted in descending order starting from recent. You can click on any profile to view the details of devices discovered during the discovery. Where can I view / edit the credential profiles for discovery? All the available credentials will be displayed under SNMP tab. You can click on any of the credential to open the edit wizard. You can also delete a particular credential by clicking the bin icon. Can I choose multiple credential profiles while creating a discovery profile? Yes, there is no restriction on the number of credential selection, so you can select as many credentials as you like. Can I choose the devices to be added after they get discovered? Uncheck the "Add devices after discovery without user intervention" option. Save the settings. Trigger a new discovery. Click here to know more about how to discover your network. Select the latest report to view the progress. Once the discovery is 100% complete, you can choose the devices which you want to add to inventory and click on 'Add to Inventory'. If a device is already discovered and added to Network Configuration Manager successfully there won't be any effect if you run the same profile again and try to discover the device again. In case the device was not added during first discovery due to some reason, and now it satisfies all the conditions to be added then the device will be added to Network Configuration Manager successfully. Why devices are discovered as unknown devices or why the reachable devices are not added to Network Configuration Manager? SNMP is not enabled:Network Configuration Manager can discover only SNMP enabled devices, so make sure that SNMP is enabled for the device. SysObjectID not present in Network Configuration Manager: If all the above mentioned criteria's doesn't apply to the device you are trying to discover, then please check the list of SysObectID's supported by Network Configuration Manager under Settings > Network Configuration Manager > SysObjectID Finder. Click on Add and provide the device ip address and other required information and click next. Network Configuration Manager will find the SysObjectID for the device and you can assign it to appropriate device template. You can get more information about adding SysObjectID and their usage here, If you are still having trouble discovering your device(s), please contact Network Configuration Manager support team. Where can I find and edit all the added discovery profiles? There you can see the list of all the discovery profiles created earlier. You can click on any profile to edit it. You can also delete the profile by clicking on the bin icon for the respective row. Can I reschedule the already added profile? Click on the profile you want to reschedule, this will open the edit discovery page, at the bottom of the page, expand the schedule section and edit the parameters as required. Where can I view/edit the credential profiles for discovery? Is there any report where I can check the status of previous discoveries? Yes, you can always check the details like no of devices added, deleted or the time it took to discover all the device etc. under Settings > Discovery > Discovery Reports > Select Reports from the top right corner. What should be done if the protocol needed is not listed for the chosen Device(s)? After adding the device, while applying the credentials, if you don't find the protocol that you need, listed in the apply credential slide, then it means the Device Template used to add the device, does not support that particular protocol. To resolve the issue please contact Network Configuration Manager-support team and we will create a new device template for you, which can then be used to get the desired results. What is the purpose of additional credentials for a device? TFTP/SCP Server Public IP: When the device is present outside the private network (i.e. when the private IP of Network Configuration Manager is not reachable for the device) this parameter can be used to provide the public IP of the Network Configuration Manager server (NAT'ed IP of Network Configuration Manager). This IP will be used in Configuration backup via TFTP / SCP. In case you have not chosen any TFTP or SCP protocol, this field can be ignored. Telnet/SSH Port: By default Network Configuration Manager uses port number 23 for Telnet protocols and 22 for SSH protocols, if you wish to change it, you can change this field. If you choose to change this field, the change will be effective only for the selected device. Login Prompt: The text/symbol that appears on the console to get the typed login name is referred as login prompt. For example, "Username@" here '@' is the login prompt. Another example is "Login:" here ':' is the login prompt. These prompts are pre-defined in device's settings and while applying the credential one shall provide the exact prompts for Network Configuration Manager to access the device properly. Password Prompt: The text displayed on the console when asking for the password. For example, "Password:" has ':' as the password prompt. These prompts are pre-defined in device's settings and while applying the credential one shall provide the exact prompts for Network Configuration Manager to access the device properly. Enable User Prompt: The text displayed on the console when asking for Enable UserName. For example, "Username@" here '@' is the login prompt. Another example is "Login:" here ':' is the login prompt. These prompts are pre-defined in device's settings and while applying the credential one shall provide the exact prompts for Network Configuration Manager to access the device properly. Enable Password Prompt: The text displayed on the console when asking for password. For example, "Password:" has ':' as the password prompt. These prompts are pre-defined in device's settings and while applying the credential one shall provide the exact prompts for Network Configuration Manager to access the device properly. What is "Prompt" in Credentials? Prompt is a text/symbol that appears on the console after successfully logging into a device. Please refer the image given below for more details. In the image given above, after providing the correct username and password the device name is shown with '#' symbol which is the indicator that the user can now enter commands to use the device. That '#' symbol is the prompt in this case, and shall be provided while applying the credentials. These prompts are pre-defined in device's settings and while applying the credential one shall provide the exact prompts for Network Configuration Manager to access the device properly. What is "Enable Prompt" in Credentials? Enable Prompt is a text/symbol that appears on the console after you have successfully entered into the enable mode of device. Please refer the image given below for more details. In the image given above, after providing the correct username and password and executing the 'enable' command, user is in enable mode and the device name is shown with '#' symbol which is the indicator that the user can now execute commands in enable mode. That '#' symbol is the enable prompt in this case, and shall be provided while applying the credentials. These prompts are pre-defined in device's settings and while applying the credential one shall provide the exact prompts for Network Configuration Manager to access the device properly. What is the difference between Telnet and Telnet-TFTP protocol in credentials? What is the difference between SSH and SSH-TFTP / SSH-SCP protocol in credentials? SSH-TFTP and SSH-SCP protocols allow file transfers for various operations like uploading a configuration to the device. These operations can't be performed with SSH protocol. SSH-SCP is a more secure protocol than SSH-TFTP. What is a Credential Profile? It eases the process of applying credentials to multiple devices at a time. You can name common credentials, to make them easily identifiable. You won't have to provide every single parameter multiple times for devices that are using same credentials. If any parameter for accessing multiple devices is changed and all those devices are associated with a single credential profile, then you can simply edit the credential profile instead of changing credentials for each device one by one. What to do if Enable Username and password are not configured? If your device doesn't use any username or password for entering the enable mode, you can simply configure the "Enable Prompt" value in credentials and ignore the "Enable Username" and "Enable Password" fields. What to do if Enable Username is configured without a password? If your device is configured to use only a username to enter enable mode and not the password, please provide the "Enable Username" and "Enable Prompt" while applying credential and you can provide any dummy value in the "Enable Password" field. Can we have multiple values for prompts? Yes, multiple values in the form of a regular expression can be provided for prompts while applying credentials. Network Configuration Manager will determine the appropriate prompt value from the ones provided in the regular expression. Can we have one profile for SNMP/SSH/Telnet protocols? Yes multiple protocols can be included and configured in a single credential profile. Please click here to know more on how to create a credential profile. 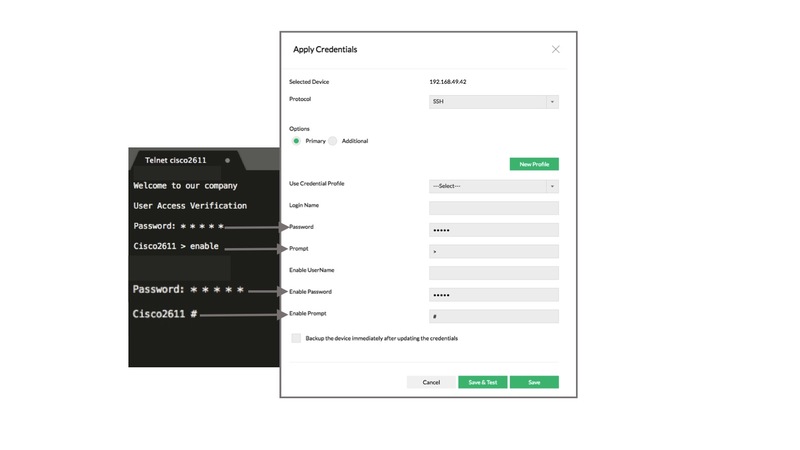 Once the profile is configured with multiple protocols, you can use it to apply the credentials and while applying credentials, you can select the appropriate protocol for that particular device or set of devices. I have applied credentials for a set of devices using a credential profile. How do I change credential for a single device out of that set? When credentials are applied to multiple devices using a credential profile, it is easy to edit the credential profile to edit credentials for all the associated devices. But in case if you want to change credential for a single device out of that set, you will have to remove the association from the credential profile first. Please follow the steps given below to change credential for a single device associated to a credential profile along with other devices. Click on the credential icon for the said device from device list. Alternatively you can select the device and click on the 3 horizontal dots on top right and click on "Apply Credentials". Make the necessary changes to credential parameters. SysOID or System Object ID is an id provided to all the SNMP agents. This ID is used by Network Management systems like Network Configuration Manager to automatically detect the monitoring capabilities of the given device and some other useful information about the device. What is the use of SysOID in Network Configuration Manager? Discovery: To add a device in Network Configuration Manager it must be associated to one of the device templates available in Network Configuration Manager, and during discovery Network Configuration Manager use device's SysOID to determine the appropriate template for the given device. EOL/EOS Information: Network Configuration Manager also determines the EOL (End of Life) and EOS (End of Sale) dates for a particular device based on its SysOID. Although this information can also be gathered using the Series and Model of the device but it may not be accurate. So please keep the SysOID mapping updated for your devices under Settings > Network Configuration Manager > Device SysOID Mapping page. Where can I find the manually added SysOIDs? You can find all the manually added SysOIDs under Settings > Network Configuration Manager > SysObjectID Finder > Click on Custom on the top right corner. Can I edit/delete the already added SysOID? Can I update SysOID for a whole group of devices? Yes, you can update SysOIDs group wise. Please select the 'Select Device Group option' under Update SysOID page and select the group you want to update from the given drop down. Only public groups will be shown in the drop down, so make sure the group you are trying to update is marked public. Alternatively you can select multiple devices from the given list of devices. I have triggered the update option from Update SysOID page but still I can't see the SysOID mapping in Device SysOID Mapping page. Updation of SysOID may take several minutes depending upon the no. of devices you have selected and also the no. of SNMP profiles you have selected. So please wait for some time and if you still don't see the SysOID's updated in the mapping table, please make sure you have chosen the right SNMP profiles to update the information. Also make sure that the devices you are trying to update the information for, are SNMP enabled. If none of the above mentioned troubleshooting methods works for you, kindly contact the Network Configuration Manager support team and we will be happy to help you. Please make sure the device is reachable and also the SNMP is enabled for the device. Also make sure the credentials provided to find the SysOID are correct. If any of the reasons mentioned above is the root cause for your issue, then you will receive an error message after the timeout exceeds. If this information doesn't help and you are still facing the issue in finding SysOID, feel free to contact Network Configuration Manager support team, we will be happy to help you. What is a device template? Device Template is a set of configurations, which contains some device specific commands to enable Network Configuration Manager to perform backups and other device specific actions on a particular device. Network Configuration Manager comes bundled with over 200 device templates which in turn supports over 4000 devices. You can also add custom device templates according to your requirements to manage additional devices, or a new device template can be requested from Network Configuration Manager support team. What are all the important information one needs to know before creating / editing a device template? Command to disable pagination in the devices. Command to fetch the running configuration. Command sequence to fetch the configuration using Telnet or SSH. Command sequence to show the configuration version information. Command to enter configuration mode on the device. Command to exit configuration mode. Command sequence to upload configuration using Telnet or SSH. Command sequence to commit a configuration change on the device. What are the command template variables used by Network Configuration Manager? Note: Not all commands are supported on device. What are some of the best practices while creating/editing a device template? Try to check multiple device templates to get a hang of all the appropriate command syntax. Gather all the information required for your device template. Find out whether you need to use any pre-command or command variable while creating/editing the device template, if yes what are they and where to use them. Try to create a device template tweaking existing device templates instead of going for a completely new device template from scratch. Always make a backup copy of a device template before modifying it. What is real time change detection? Real time change detection is a feature provided by Network Configuration Manager which allows you to monitor every single change made to a device's configuration and trigger an automatic backup and can notify you about any unauthorized change. What are some troubleshooting steps if real time change detection is not working for my device? Configured syslog server is up and running. Syslog services are running. You can check this and start the service if not running by going to Settings > Basic Settings > Server Settings. Check if the proper port is configured for the server. Check if the device is forwarding syslogs or not. You can use the ManageEngine's Syslog forwarder tool to detect this. It's free to use. Network Configuration Manager is showing that 'The selected device(s) do not support Configuration Detection through Syslog'. What should be done? The device is configured with SNMP credentials: If you have added the device using Network Configuration Manager discovery, then the device will be configured with SNMP credentials or if you have manually applied SNMP credentials to the device then the change detection can't be enabled for the said device. Network Configuration Manager can't detect syslog messages with SNMP credentials. Please change the credential protocol to either SSH or Telnet. If it still doesn't work, please contact the Network Configuration Manager support team . Configured device template doesn't support real time change detection: If the selected device template which was used to add the device to Network Configuration Manager does not support real time change detection, you will be shown this message. Please contact Network Configuration Manager support team to help you with the issue. What is logging level and what its value must be set to while enabling real time change detection? Informational: These types of logs can be generated by the device to provide some basic information. Notice/Notification: These types of logs can be generated to provide a notification to the user. Warning/Alert: These are the most severe types of log and are generated to notify that something unusual has occurred with the device for example an unauthorized change. Based on your need, you can set a level of logging while enabling real time change detection. This setting can be changed later using the same option. Once the logging level is set, Network Configuration Manager will notify you and will trigger a backup for all the logs that have the same or higher level as the one you have chosen. Note: The above given list of log levels is just for example, and the actual type of log levels may differ for your device. Can I enable/disable real time change detection for multiple devices at a time? Yes you can enable/disable real time change detection for any number of devices simultaneously. Please click here to know how to enable/disable change detection. Labelled configurations are normal device configurations but with a name (label) assigned to them. This helps us in distinguishing a configuration from all the other configurations for a particular device and allows us to find the necessary configuration easily. Any configuration that seems important, or may be needed in future, or if you want to save it as a fall back option if something goes wrong, can be associated with a label. What is the benefit of using labels for configuration? You can label a configuration to distinguish it from all the other configurations for a particular device. For example, you can label a very stable configuration as 'Stable' before making a critical change in the configuration. So if anything goes wrong, you can easily find your labelled device and revert to it. Since there are lot of configuration backups for a particular device, labeling a configuration helps you to easily identify a particular configuration among the hundreds of configurations for a specific device. What are the different types of operations that can be scheduled via Network Configuration Manager? Can I disable an already scheduled task for a temporary period? Yes, a schedule can be disable temporarily without removing it permanently. To do so, go to Settings > Schedule > All Schedules. Click on the Enable/Disable toggle button under Status column for the schedule which you want to Enable or Disable. Can I execute a schedule on demand? Yes, a schedule can be executed on demand before its scheduled time. To execute a Schedule on demand, go to Schedules page from Settings > Schedule > All Schedules. Click the "Execute Now" option from the Action column for the schedule you want to execute. Can I see the history of Schedule Execution? Yes, schedule execution history can be accessed from Settings > Schedule > Schedule Audit. Can a task be scheduled for multiple devices? Yes, you can schedule a task for as many devices as you wish at a time. You can also select a device group for scheduling a task while creating the schedule. Click here to know more about how to create a schedule. I have scheduled a task, but I am not receiving any email notification. What shall I do? If any of the email addressees mentioned while creating the schedule are not receiving the notifications, then check the mail server settings under Settings > Basic Settings > Mail Server Settings. You can also send a test mail to ensure that the mail server is configured properly. If the mail server settings are working fine and if you are receiving the test mail without any issue, but you are still not getting the schedule notification, then please contact Network Configuration Manager Support team for further help. A configlet is a configuration script that is transformed to a CLI configuration string before being applied to a device. The dynamic elements (strings) in configlets are defined using variables. These variables act as an input to the process of transformation to construct the CLI configuration string. These variables can contain anything: the interface name, device name, description text, or any similar dynamic values. The values of these variables are either defined by the user or system, or determined by the context at the time of execution. The Configlets help in automating repetitive and time-consuming configuration tasks. All you need to do is to create a small Configlet containing the required commands and then execute the Configlet for carrying out repetitive tasks for many devices, multiple times. The Configlets can also be scheduled for execution at a certain point of time in future. This helps in executing the tasks without the intervention of the administrators. The Configlets enable the network administrator to apply the changes to multiple devices at one go. Also, the Configlets provide the benefit of carrying out exact changes with precision. Can I import/export a configlet? Yes a configlet can be imported/exported from and to a file. Go to Settings > Configlets page Click on "Import" to import a configlet. Provide a XML file containing configlet details, and click on Import. To export a configlet, select the configlet from the list and click on "Export". Can I schedule a configlet execution? Yes a configlet execution can be scheduled. To schedule a "configlet execution" please click on the Schedule icon in the last column of Configlet list under Settings > Configlets. This will open up a slide to add the schedule. Provide the necessary details for the schedule and click on save to save the Scheduled task. Results of every schedule execution can be seen under the "Execution History" tab. What is 'Add To Snapshot' option in the Configlet page? You can add a particular configlet or a group of configlets to the Action menu of device snapshot using this option. Once you select a configlet or multiple configlets, click on 'Add to Snapshot'. This will open a slide where you can choose the device template which you want to associate the configlet(s) with. Once associated, configlet option can be seen in the Action Menu of Device Snapshot page under "Configlet Actions" section. This is useful if you execute the said configlet(s) very often for a particular device or device type. Where can I check the history of Configlet Execution? Configlet Execution History can be checked under Settings > Configlets > Execution History tab. A report can be exported as PDF for each record in history. Click the PDF icon provided in the last column of the record to export the report. Can I enable SNMP with Configlets? Yes, SNMP can be enabled or disabled using Configlets. Refer to your device specific command to enable SNMP and use the same command to create the configlet using Script Execution Mode. Can I apply same configuration commands in multiple devices using Configlets? What are the types of Configlets execution mode? TFTP Mode - for uploading a partial configuration change to a device/devices through TFTP. ﻿TFTP mode is for uploading a partial configuration change to a device/devices through TFTP. To execute a single command on the CLI console. ﻿To execute a series of inter-connected commands on a device in command line. After the execution of one command, some input has to be provided before the next command is invoked. In such a situation, advanced scripting would be useful. Example: Synchronizing Running & Startup Configurations. Through a single line in the script containing the command copy running-config startup-config, you can synchronize the startup and running configurations of any number of devices. In all the above case, TFTP mode of configuration upload could be used. In general, for carrying out changes to existing configuration, this mode could be used. For other cases like executing a command on device, Script execution mode has to be used. What happens when the configuration command changes the command prompt? At any step of configlet execution, if the command prompt changes then this change must be explicitly handled while creating the configlet. You can add an attribute called "Prompt" for the command which will use a different prompt value, and mention the prompt as the value to the attribute. Note: "Prompt" attribute is supported only in Advanced Script Mode. How to provide/define the user input parameters in configlets? While creating the configlet, in the text field 'Configlet Content', enter the configuration commands that are to be uploaded to the device. While entering the configuration command, use %% to create a Variable. For instance: snmp-server community %COMMUNITY% RO. Here COMMUNITY will act as a variable for the command. If a variable has been created/defined in the configlet. You have two options here to enter the desired value for the respective configlet variables. Same value for all devices: If you want to specify the same value for a particular configlet variable for all devices, choose this option and enter the value. For example, for '%COMMUNITY%', you can provide 'public' as the value. After entering the values(s), you can preview the actual configuration with full configuration commands and value for community variable(s). Column headers should be the same as that of the Configlet Parameters defined in the configlet with the entries separated by a comma. "RESOURCE" column is mandatory and it should be the first column in the file to identify the devices on which the script needs to be executed. The value for RESOURCE should be either host name / ip address. One line can hold the entries for one device. What are flow export configlets and how to use them? Flow Export Configlets are used to export the flow from the device to a particular server. You can create a flow export configlet and assign it to a particular device template. Go to Settings>Configlet>All Configlets from Main Menu. Enter all the necessary details for the configlet. Save the configlet using the Save button. Go to "Flow Export Configlet" tab. Click on "Add Flow Configlet"
Choose the newly created configlet and move it to the right hand side of the select box. Click on the 3 horizontal dots at the top right corner to get device option list. If the credentials are not assigned to the device, you will have to provide the device credential, if the credentials are already present, then this step will be skipped automatically. Select the interfaces in next step. Interfaces will be listed only after successful configuration backup for the device. You can skip interface selection if you do not want to configure interfaces. Select the newly created 'Export Flow Configlet' in next step. Can I use $variable in all Configlets? $Variable are used only for Flow Export Configlets in Advanced Script Mode. These variables are used to define dynamic data to be used for flow export configlet execution. For other configlets we support only %variable%. What is Syslog Flood Prevention? In an environment where the users login and logout of devices more frequently, flooding of Syslog messages tend to occur. This leads to increased CPU usage of the Network Configuration Manager server which in turn affects the performance of the machine. To prevent this, Network Configuration Manager blocks the syslog messages from that device and notifies the user about the device that has been blocked. The blocked devices are listed in Settings > Device Management > Syslog blocked hosts. Since backup automation relies on syslog messages, Network Configuration Manager does not detect changes automatically for the blocked devices until the devices are unblocked. You can unblock the devices at any point of time from the blocked list and before unblocking any device make sure that the problem is resolved for that particular device. Please click here to know more about how to unblock a device. What can be done to avoid syslog flooding? Temporarily turn off syslogs for the blocked devices. Lower the syslog level to restrict the number of syslog messages. What is the default block time for any host that is flooding Network Configuration Manager with syslogs? Network Configuration Manager will block any host that is flooding the system with syslogs, for two hours. Post 2 hours the host will be unblocked again, and Network Configuration Manager will receive the syslogs from the said host. If the number of syslogs are still high, then the host will be blocked again for two hours. Can I choose to turn off the syslog flood prevention? Yes, syslog flood prevention can be turned off at any time, though it's not recommended because a huge number of incoming syslogs will increase the CPU use and will slow down Network Configuration Manager. Take extreme precaution before opting to turn off syslog flood prevention. To turn off flood prevention, please go to Settings > Global Settings > Client Server Settings and uncheck the checkbox next to "Enable Syslog Host Blocking" option. Save your changes to turn off the syslog flood prevention. If you wish to turn it on, check the same checkbox again and save your changes. What is the threshold to block a device? A device will be blocked by NCM if it sends more than 200 messages in 2 minutes of time. Is threshold for blocking a device configurable? Yes, threshold for number of messages in 2 minutes, after which the device will be blocked, can be configured by changing the system property "syslog.PER_HOST_MSG_COUNT" in "system_properties.conf" file under "/conf" folder. Please add the property in the file if not already exist. What is Exclude Criteria and where it is used? Exclude Criteria is a line or part of a line or a regex that represents a line from the configuration, and that need not to be considered for calculating differences between two configurations. For example, timestamp for a configuration will change based on the time backup was taken. There may not be any other change between two backups but just because the timestamp is changed, Network Configuration Manager will show you difference on that particular line. To avoid this we can create a exclude criteria and assign it to a particular device template and Network Configuration Manager will ignore changes on that particular line. Can the criteria while creating Exclude Criteria be in Regex form? Yes, Network Configuration Manager supports regex as exclude criteria. Can criteria for multiple lines can be provided in a single exclude criteria? No, any exclude criteria will match the criteria with only one line of configuration at a time. To exclude multiple lines, please create different exclude criteria and associate them to the same device template. Note: This doesn't mean that you have to create multiple criteria for the same line if it occurs multiple times in the configuration. This applies to the case where you want to exclude multiple lines that are completely different from each other and can't be represented as a single regex. Can we have multiple exclude criteria for a single device template? Yes any number of exclude criteria can be created and associated to a particular device template. Can exclude criteria be applied to a single device and not a device template? No, exclude criteria's can only be applied to a device template and not to a particular device or configuration. What is Terminal Tool in Network Configuration Manager and why is it needed? Terminal tool provides you functionality to open a terminal session with any network device and perform CLI commands directly from Network Configuration Manager. Why is it needed? We already have terminal options in device snapshot for each device, then why do we need a separate tool for the same thing? Well, the terminal tool can be used to open terminal sessions with network devices that are not added in inventory, or the devices that you don't wish to add in inventory. For example, if you want to connect to a Linux machine and perform some commands, you can do so by adding the Linux machine directly under Tools > Terminal > Custom. It also allows the user to open terminal sessions for Inventoried devices with just one click. What are the types of protocol that can be used to make a terminal connection? A terminal session can be started using either SSH or Telnet protocol. What is Inventoried tab, and what can be done with the devices listed there? Inventoried tab lists all the available devices from Inventory > Devices. You can open a SSH or Telnet terminal session for the devices listed under this tab with a single click. You won't be able to add/modify or remove any device from this list directly from Terminal Tool. Can devices with SNMP credentials use terminal? No. While adding a Custom Terminal Device, you won't have a option to provide SNMP credential, but there can be an inventoried device with SNMP credentials listed under Inventoried tab. If you try to perform any terminal action for those devices, it will fail after a particular timeout period. Is it possible to delete Inventoried devices from Terminal Tool? No, you can't add/modify/delete an inventoried device from Terminal Tool. If you wish to delete an inventoried device, delete it from Inventory > Devices. What are Terminal Device Groups? How are they used? Terminal Device Groups are similar to normal device groups in Network Configuration Manager, they are used to group similar custom terminal devices together. Now, we are not using the device groups for any particular action, but we have a plan to assign the groups to the users in future. So whenever a new device is added to a certain group, it will be available for all the users who have access to the said group. Where can I see the history of all terminal actions performed in the past? History/Audits of all the Terminal Actions is available under Tools > Terminal > Audit History. You can filter the audit records based on device type (Inventoried, Custom or Both). If I add a Custom Terminal Device, will it be visible to all the users? Only Me: Device will be visible only to the user who has added it. Admin: Device will be visible to the user who has added it and all the admins in the system. Everyone: Device will be visible to everyone. Visibility of a device can be changed at any point of the time. What is the file format that is being used to export device configuration and can I change it? Currently Network Configuration Manager exports configuration only in text format (.txt files), and this can not be changed, but we are working on providing more export option soon. Can I change the default location to save the exported configurations? Yes, you can give any preferred location to save the exported configuration files. To change the location, go to Settings > Global Settings > Export Configuration and provide the desired location under "Destination Directory" field. Can I select the version of configuration that needs to be exported? Where can I check the history of previous configuration export? History of the all the export configuration operations can be accessed from Settings > Global Settings > Export History. What happens when I export the configuration multiple times on the same day? Network Configuration Manager saves the exported configuration in a folder name with current date, so if you try to export configurations multiple times on same day, Network Configuration Manager will just overwrite the previously exported file and keeps the latest files in the same folder. Does Network Configuration Manager notifies me once the export process is completed? Yes, Network Configuration Manager notifies you once the export process is completed, you can mention the email id(s) where the notification needs to be sent under Settings > Global Settings > Export Configuration page. Select any particular frequency (Daily, Weekly or Monthly) to export the device configuration and mention the email id(s) under "Notify on completion by Email" field. Multiple mail ids can be provided in a comma separated list. You can also choose to receive notification only when the process fails by checking the 'Notify only on failure' checkbox. Which configuration will be exported from the selected devices? What is the use of third party syslog servers? A Syslog Message will be sent to a default Network Configuration Manager Syslog Server if the configuration is changed and change detection is enabled for the device, but in some cases you may want the syslog messages on a specific server of your choice, in that case you can add the server ip addresses under Settings > Global Settings > Third Party Syslog Server. Network Configuration Manager won't forward the messages to these servers, messages will be directly sent by the device. Can I configure multiple syslog servers at a time? Yes, multiple syslog servers can be configured to receive syslog messages. Please click here to know about how to configure external servers for syslog messages. Will any of the deleted records while cleanup be archived or will they be deleted permanently? Network Configuration Manager doesn't keep a backup of any records that are being removed during cleanup. Everything will be deleted permanently. Hence, it is advised to be extra caution while giving the parameter values for the no. of days for which the records need to be kept after cleanup. When does Network Configuration Manager perform the cleanup and what is the frequency? Network Configuration Manager performs DB clean up once a day. The default time for the cleanup is 2 AM, but this can be changed to any time of the day from Settings > Global Settings > Database Administration, under "DB Cleanup Time" heading. Can I reschedule DB cleanup time? Yes, the default time for the cleanup is 2 AM, but this can be changed to any time of the day from Settings > Global Settings > Database Administration, under "DB Cleanup Time" heading. Can I change the frequency of the schedule? No, for now Network Configuration Manager does cleanup only once a day and this frequency cannot be altered, although you can change the time of the day at which Network Configuration Manager performs the cleanup. What happens to the device audit details once the audit history is deleted? Since the deletion operation performed during cleanup is permanent, if any of the device audit records deleted during the DB cleanup, you will not be able to see the details for those particular audits thereafter. What happens to the baseline configuration version of the device when it qualifies for deletion during DB cleanup? Network Configuration Manager gives more priority to the baseline configuration version than the conditions provided for cleanup, so for example, if you have chosen to keep only the last 10 configuration version and your latest version is 30 but the baseline version in 8, Network Configuration Manager will keep all the configuration starting from 8 to 30 instead of keeping just the versions 21 to 30. What is "Password Manager Pro" in Network Configuration Manager? Password Manager Pro or PMP is a password vault developed by Manage Engine which allows you to save all your device credentials in one place and once it is integrated with Network Configuration Manager, you can sync the credential changes for all the devices with a single click. Click here to know more about how it works and how to configure it. Can I edit the password of a particular device manually after syncing it with password manager? Yes, the passwords can be changed manually even after synchronizing it with PMP but if you wish to change the password for a particular device manually, remove the association of that device with PMP first, if not, PMP will change the password back to the original one whenever you choose to sync it next time. Can Network Configuration Manager sync the passwords periodically from Password Manager and How much time does it take for a password change to get reflected in Network Configuration Manager? Network Configuration Manager does not support automatic syncing yet but we are in process of developing the feature to schedule the sync process. The option will soon be available under Schedule page in Network Configuration Manager. For now users have to intervene, to sync the passwords with PMP. Please click here to know more about how to sync the passwords with PMP. What is Syslocation and description and why do we need to update these values? "System Location" and "System Description" are two fields in the device that network admins can set to give any additional details about the device. "System Location" is generally used to provide the physical location of the device in the network and System Description can hold any additional important information that needs to be communicated to the other users. Updating these values in Network Configuration Manager will help the users to access them directly from device snapshot page, without running any additional command on the device. After updation, where can I check the Syslocation and Description value? Syslocation and Description values can be checked in Device snapshot page, under 'System Location' and 'System Description' headings, respectively. Please go to Inventory > Devices and click on any device to access the snapshot page. Can Syslocation and Description values be updated for multiple devices at a time? Yes, Syslocation and Description value of multiple devices can be updated in one go. Please click here to know how to update syslocation and description. Can I select multiple SNMP profiles for updating Syslocation and Description values? Yes, any number of SNMP profiles can be selected to update Syslocation and Description. Network Configuration Manager will automatically select the appropriate SNMP credentials for each device. What is an upload request and when are they created? An upload request is created whenever an operator user is trying to run a configlet, or trying to upload a configuration or draft for a particular device. All the admins will be notified about this request and any one of them can approve/reject the request. Only after the approval of the request, respective changes will be carried out to the device. Can I change the status of an already approved/rejected request? No, a request, once approved or rejected can't be changed back to its original state or to any other status. What happens when a request is approved or rejected? An upload request is generally created when an operator is trying to make changes to a device configuration by either uploading a configuration, a draft or for running a configlet. These changes don't have any effect until the request is approved. As soon as the request is approved, the respective changes will be made to the selected device(s). A change notification is a notification which can be sent to a user/server whenever there is a configuration change in the startup, running or both configurations of any device(s) or device group(s). You can create a change notification under the Change Management tab in Main Menu. Click here to know more about how to create a change notification. These notifications can be sent as an email, SNMP trap, Syslog messages or tickets. You can also choose to rollback the changes back to the previous version or to the baseline configuration version using these notifications. Please click here to know more about the different types of notifications and how to configure them. What are the different types of Change Notification Actions? Email: An email can be sent to multiple recipients alerting them about the change. You can compose the subject and the email body for the mail that will be sent. For both the subject and the body you can choose to select some useful variables that will give you more information about the change. These variables are listed in front of the Subject and Message field. Some commonly used variables are $CONFIGTYPE (to get the configuration type that is changed. ), $DEVICENAME (to get the device name for which the configuration is changed. ), $CHANGEDBY (to get the user/system name who made the configuration change.) etc. Sylog: A Syslog Message will be sent to the specified Syslog Server if the configuration is changed. Syslog Message will include the configuration type (CONFIG_TYPE), change type (CHANGE_TYPE), ip address (IP_ADDRESS) and changed by (CHANGEDBY). Ticket: A trouble ticket can be sent to the support team email(s) that can be specified under 'Send Trouble Ticket To' field. The configuration of the trouble tickets are similar to that of a mail notification. Rollback: You can also choose to rollback the changes that caused this notification. There are two options available for rollback. You can either choose to rollback to the previous version or you can rollback to the baseline version. Can multiple actions be carried out for a single change? Yes, you can select any combination of actions from the given 5. Please click here to know more about these actions. With the increasing security threats to network resources, enterprises are required to follow standard practices, and execute internal/external security policies to remain compliant with the latest industry standards. Therefore, ensuring network compliance has become a priority for network administrators. But, it is a mammoth task to scrutinize and make changes in a networking environment consisting of network devices from multiple vendors. Network Configuration Manager helps administrators analyse network devices to achieve auditable network compliance across industry-specific compliance policies. Every time a configuration is backed up, Network Configuration Manager will automatically run a compliance check on those configurations. Network Configuration Manager also alerts and generates reports whenever a rule/policy gets violated. Conditions or lines that should be either compulsorily present or not be present in a configuration file are called compliance rules. A typical example for a rule is checking the access list configuration or checking the community string. Decide what amounts to violation - presence or absence of a particular line or a set of lines in the configuration file. There are 3 different types of criteria that you can define to create a rule. To know more about these criteria, please click here . What is a Remediation Template? A remediation template is a configlet that can be defined while creating a rule, so that if a policy is violated because of the defined rule, Network Configuration Manager will execute the configlet automatically and fix the issue with the configuration to make it compliant with the policy. Please click here to know more about how to create a configlet. What is an Adhoc Test? 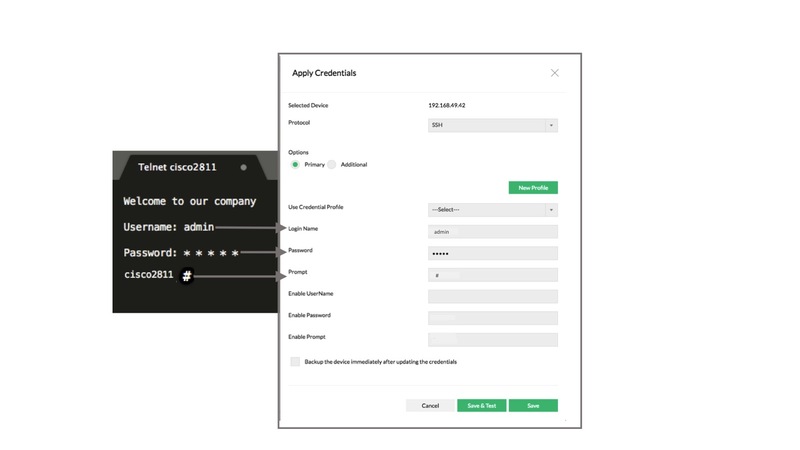 During any stage of compliance policy creation (rule creation, rule group creation & policy creation), you can perform checks on adhoc basis to test the validity of the rule/rule group/policy added by you. The adhoc tests depict the results then and there. After adding a rule, you can perform adhoc test for a device/device group by clicking the "Adhoc Test" button present under Compliance > Rules page. Similarly, adhoc tests can be performed for rule group from Compliance > Rule Groups page and for Policy from Compliance > Policies page. Can I generate a report for all the policies at once? Yes a consolidated report for all the policies can be created at once. Go to Reports > Compliance report and click on the PDF icon provided in the top right corner of the page to generate the report. You can also select the device group for which you want to create this report. Sometimes, you might have to group devices based on some logical criteria. For example, you may wish to create groups such as a group containing all cisco routers, or a group containing all cisco switches or group based on device's physical locations etc., This would help in carrying out certain common operations with ease. What operations can be performed on device groups? Where can I check the devices associated with a device group? List of devices associated with the device group can be checked by clicking on the device group name in 'Grid View' of device group page under Inventory > Groups. To check the list of devices in 'Widget View', click on the expand icon present on the top right corner of each widget. What are the different types of reports available in Network Configuration Manager? Network Configuration Manager can generate 17 different types of reports which are classified into 4 different categories. Following is the list of reports available in Network Configuration Manager with their respective categories. Compliance: Details on the violations and compliance of the associated policies of the devices. : The status of PCI Review made by the specified administrator/ operator as to whether the reviews are pending or completed, are presented in this report. What are the different file formats, in which a report can be exported? A report can be exported in either PDF or CSV format. You can also choose to mail a report and it will be sent as a PDF. To know more about how to generate a report, please click here .